With trial sniffer dog cancer screenings being carried out in a Japanese town, researchers are hoping to one day make the noninvasive health checks widely available across Japan. But experts say securing experienced handlers and attracting financial resources will be crucial to boosting the number of trained sniffer dogs available to make the unique program more practical to implement in future. In Japan, there are only five cancer sniffer dogs. All of them were trained by Yuji Sato, 70, who heads a dog training center, St. Sugar Japan, based in Tateyama, Chiba Prefecture, near Tokyo. 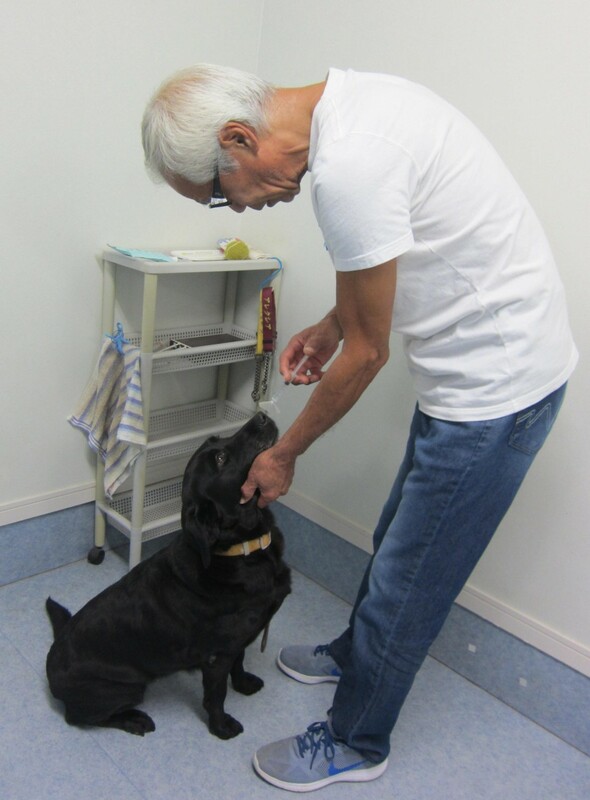 The Labrador retrievers are busy analyzing urine samples from residents of Kaneyama, in northeastern Japan's Yamagata Prefecture, where locals have signed up for cancer screening trials that began in May. Each dog reacts differently, but one of the dogs consistently stops in front of a box where it detects some sign of cancer in a urine sample. Since the cancer-indicating odor is much less pronounced than that of drugs or footprints normally sniffed out by police dogs, training requires significant effort and technique, said Sato. "They can only demonstrate cancer sniffing ability through the repetition of daily training. A handler has to carefully look at their character, condition, temperature and hormone balance change as these factors affect their performance," he said. It costs about 5 million yen ($44,000) to train a dog over three years. To boost effectiveness, two years or more of additional training may be needed, according to Sato. Although Sato is willing to train more dogs or teach handlers, he said, "With the current financial capacity, the five dogs are the maximum that I can handle on my own." The screening work, undertaken in a small room, requires intense concentration; each dog works for about 15 minutes every morning and gets a stress release by playing outside in the afternoon. Not all five dogs are in the mood to work every day, so Sato limits the maximum number of urine samples to be sniffed at around 20 per day to ensure the accuracy of the screenings. As of mid-October, more than 700 men and women aged 40 or older in Kaneyama submitted their urine samples for the cancer screenings conducted as part of the town's health checkup. So far, the three-year program with a budget of 11 million yen for the initial fiscal year, has seen more than 280 people get results with several testing positive and being referred to doctors. The screenings have been well received by residents of the town because of the ease of the process which requires them to submit urine samples rather than having to undergo invasive procedures such as gastroscopies to detect even early-stage cancers, according to town officials. "Although it is too early to evaluate the program, I think there is a need to increase the number of cancer sniffer dogs if we want to boost efficiency and expand the program," said Akiei Shibata, a regional medical promotion officer at Kaneyama clinic who is in charge of the project. Researchers and doctors say that more donations, corporate investment or financial aid from the state are required for more handlers and dogs to be trained. They say such investments are worthwhile because it enables medical costs to be significantly reduced when cancers are detected early. It remains unknown exactly what the dogs smell to identify someone who potentially has cancer, but past experiments have shown that they were able to identify urine samples of cancer patients with nearly 100 percent accuracy, according to Masao Miyashita, the deputy head of the Nippon Medical School Chiba Hoksoh Hospital, who leads the trial program. Miyashita said scientists are trying to understand how the dogs so successfully identify signs of cancer in order that a device may be developed to do the dogs' job. But no one knows how many years or even decades it will take before seeing such a breakthrough. So Miyashita thinks expanding the number of cancer sniffer dogs would be more practical for now. "Together with the town of Kaneyama, we are now seeking the possibilities to set up more training centers for cancer sniffer dogs, possibly with the help of Sato," said Miyashita. Securing the right dogs and preserving unique training methods will be another important factor for expanding the program, St. Sugar's Sato said, noting that cancer sniffer dogs must naturally have a keen sense of smell. All five cancer sniffer dogs in Japan are blood-related to Marine, a beach rescue dog that Sato trained. Because of her sharp sense of smell, Marine was even cloned to produce dogs to sniff out cancer in South Korea. At first, Sato's project was rejected and ridiculed but understanding is slowly growing in Japan and other countries, he says. He hopes that his efforts will eventually help boost the health of many: "Through odor, I want to make a difference in the field of medicine," he said.